Watch the video below to learn more about some symptom management options or click through the links under the “Dry Eye Syndrome” tab above if you’d like more in depth information. 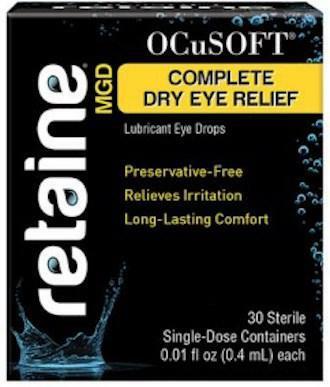 Unlike other lubricant eye drops which can evaporate quickly, Retaine® MGD™ provides long-lasting relief for moderate to severe dry eyes. It effectively delivers ingredients through the electrostatic attraction between positively charged droplets and the negatively charged ocular surface. It adds moisture while the lipid component lubricates and protects the surface of the eye. It is especially helpful in conditions associated with Meibomian Gland Dysfunction. Punctal plugs are devices that are inserted into the tear ducts. They help block moisture from draining into the tear ducts, causing it remain longer on the eye. This can truly improve dry eye symptoms and is a stouter solution to this condition than eye drops. 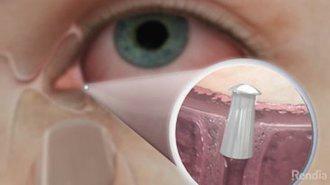 You can get a punctal plug that is made of silicone that could last for a long period of time, depending on the eye. A temporary option may be made of a fibrous material that will dissolve. Either option may be appropriate for individuals with severe or long-term dry eye. 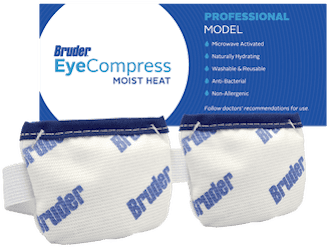 The Bruder Moist Heat Eye Compress opens oil glands and allows natural oils to flow back into the eye relieving discomfort from aging, contact lenses, use of digital devices and more. The easy-to-use compress delivers an effective moist heat treatment. Simply microwave for 20-25 seconds and apply for 10 minutes or as prescribed. Talk to Us About Your Dry Eyes TODAY! If you have been using over the counter eye drops for dry eye relief, don’t delay receiving a professional diagnosis and treatment from Lifetime Eyecare. Schedule your appointment online today or give us a call at: 616-457-0760!